This glass consists of a single pane of glass that has been subjected to special heat treatment during production, and has therefore been pre-stressed. This does not just increase the impact and bending resistance of the glass, but also makes it more resistant to temperature changes. Because it has been pre-stressed, the glass cannot undergo further processing after production. The internal stress also makes this glass sensitive at the edges. If the glass breaks, it shatters into small fragments without sharp edges. This glass is produced in a similar way to tempered safety glass, but with less pre-stress. This achieves better resistance than normal float gas, and the glass is less sensitive to minor damage than tempered safety glass. However, it is not as resistant to bending as tempered safety glass. Partially pre-stressed glass is normally used as laminated glass. In the event of breakage, the glass disintegrates into large pieces. This glass consists of two or more overlaid panes of glass each with an intermediate layer made from hard-wearing, tear-resistant film. This is how the safety characteristics are achieved. The film is made from polyvinyl butyral (PVB) and absorbs almost all UVA radiation. 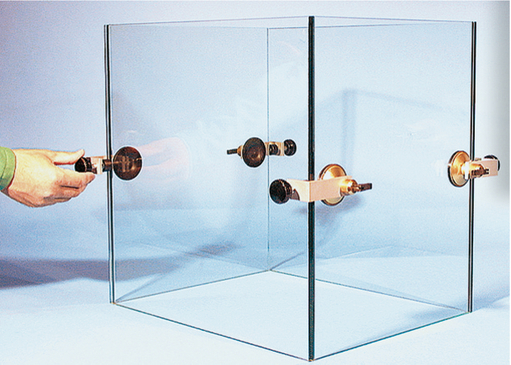 This type of glass is therefore not suitable for bonding with adhesives that are cured using UV radiation. In the event of breakage, the film holds the splinters together. Float glass is a flat glass with low temperature change resistance, which is manufactured using the float glass procedure. It is also known as window glass or basic glass, and is used for all types of glazing, mirror manufacture and also as the basic product for manufacturing tempered safety glass and laminated glass. In the event of breakage, float glass shatters into sharp-edged splinters and differently-sized pieces. Attention must be paid to the suitability of the adhesive for gluing. The choice of material and the resulting choice of adhesive (see point 3) result in different adhesive bond strengths. 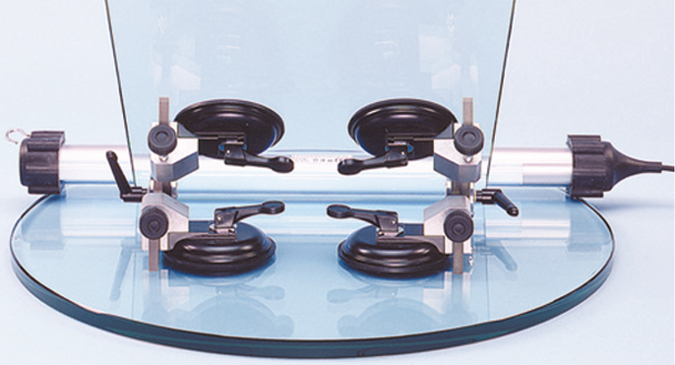 Maximum strength can be achieved when bonding glass to glass, glass to metal (stainless steel) and glass to stone. All information relates to transparent float glass that can be permeated by UV light. Clear float glass, mirror glass (reflective side), curing glass (tempered safety glass) and wire mirror glass can be bonded without any problems. Special glass types such as imbued glass and laminated glass may lead to weaker strength values or cannot be bonded at all. 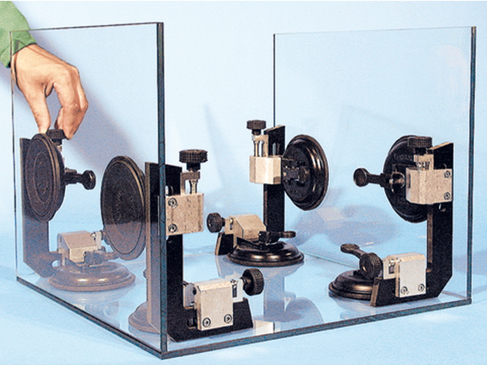 All structured glass types, such as patterned glass and wire glass, are also problematic. Permeability by UVA rays depends on the glass thickness and colour intensity. Glass types with high UV absorption such as laminated glass, coloured glass or tinted glass cannot be bonded using conventional UVA adhesives. The highly light sensitive adhesive MV760VIS 003.04.139/143 or the adhesive 682-T 003.04.114/115 with activator 003.04.132/133 has to be used to bond these types of glass. The indicated adhesive bond strengths can only be achieved with the coating thicknesses indicated in the technical data sheets. The smoother the surface that is being bonded, and the thinner the coating of adhesive (pay attention to min. adhesive coat thickness), the stronger and more loadable the adhesive-bonded joint. Too little, too much or irregular adhesive application influences the adhesive bond strength of the adhesive-bonded joint. The glass edge that is to be bonded should have a cup wheel ground finish only, do not apply pressure to the adhesive gaps. There should not be any separating agent (lubricant, polish, silicone, oil, etc.) on the surface when bonding takes place. In comprehensive test series stainless steel has proven to be a particularly suitable material when bonding glass to metal. 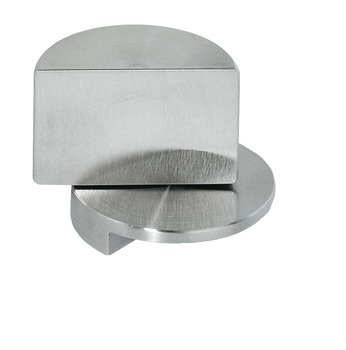 Surfaces such as untreated aluminium, chrome, nickel etc. are only conditionally suitable for gluing, and should be pre-treated with suitable additional products such as glass/metal primer or Pyrosil before gluing in order to improve the adhesion of the UV adhesives. 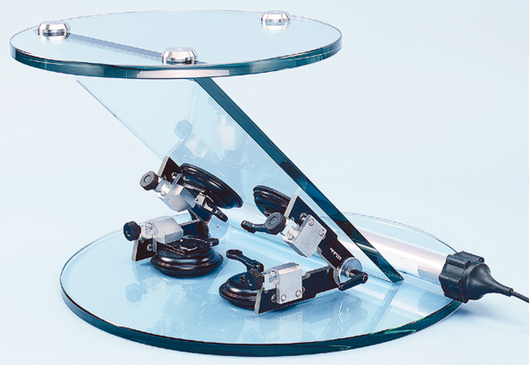 The suitability of coated or lacquered glass/surfaces must be checked before bonding. The surfaces that are being bonded must be completely clean, grease-free and dry (free of separating agent). Use suitable cleaning agents for UV bonds without tensides or separating agents. Conventional glass cleaners or cleaning agents are not suitable in most cases.Recommended: Häfele special cleaner for glass bonding Cat. No. 003.04.120 (possibly in conjunction with fine steel wool). The workpieces must be warmed up briefly and evenly before bonding. e.g. with a hot air gun, to remove even invisible traces of residual moisture (condensation) in order to ensure high and durable stability of the adhesive-bonded joint. The adhesive and the parts that are being bonded must be at room temperature when processing takes place. This avoids stress damage in the adhesive-bonded joint. Failing to do so may lead to considerable loss of strength that might not occur immediately but will result in adhesive-bonded joint breakage and impair long-term stability. Additional pre-treatment of problematic surfaces using Pyrosil® technology permanently protects bondings from infiltration by moisture and strengthens the adhesion of the part that is to be bonded. This is particularly important for use in wet areas, outdoor areas and with connections that are subject to high stress. The use of Pyrosil® does not just improve the adhesion strength of normal connections, but also makes bonding of problematic surfaces possible. The following UVA and light curing adhesives are available, depending on the requirements of the materials to be bonded and the stress applied to and use of the adhesive bonded-joints. Medium viscosity adhesives B-682-T, Cat. No. 003.04.114/115, must be used for adhesive-bonded joints that are subject to dynamic stress. When planning and constructing all-glass objects, a "closed" (i.e. 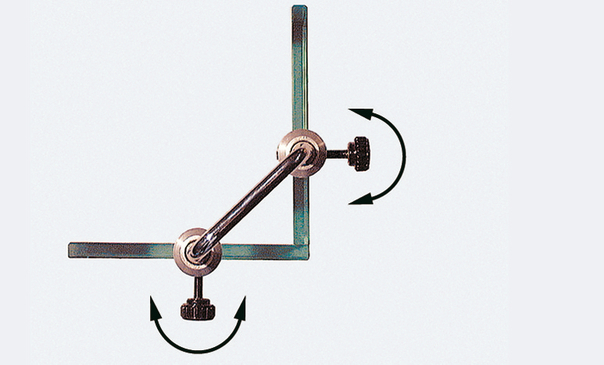 self-stabilising) structure (see fig.) should be chosen in order to achieve maximum stability. If an "open" structure is explicitly requested for design reasons or if structural changes are not possible, only the adhesives with Cat. No. 003.04.100 or Cat. No. 003.04.101 must be used for these connections. In order to allow UV adhesives to cure properly, the parts that are being bonded must be securely held to prevent vibration and slipping. Suitable fixing aids make this considerably easier. Verify that the workpieces fit exactly before applying the adhesive. This is easiest to do by means of trial assembly of the entire structure (use fixing aids). Warm up the bonding surfaces and apply the adhesive within 5 minutes; otherwise the process must be repeated. Apply adhesive with workpiece in horizontal position, if possible. 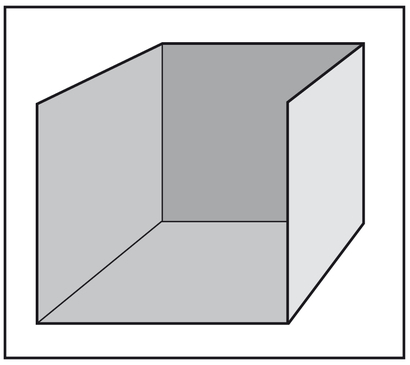 Vertical position may cause problems. Too much adhesive, i.e. too much coating thickness, reduces strength and leads to additional work for removing the adhesive residues. Exact and economical adhesive application is achieved by using suitable dispensing aids. Medium-viscosity UV adhesive is applied before joining the parts. With surface bonding the adhesive is always applied before joining the parts. With horizontal bonding a bubble-free bond is achieved by steadily and carefully lowering the workpiece. The weight of the parts is sufficient to spread out the adhesive over the entire bonding surface (do not apply pressure). Low-viscosity UV adhesive capillates itself into the adhesive gap. The parts that are being bonded can therefore be assembled in their final positions before the adhesive is applied. Please note that the bonding joints of objects that consist of multiple components must always be bonded consecutively (not simultaneously). In order to achieve optimum adhesive distribution, the bonded components should be slightly raised and lowered again before curing (increase adhesive gap and decrease adhesive gap again). Use a suitable UVA curing light ("lamp") for curing the adhesives: The lamp must not be smaller/shorter than the bonded edge to avoid tension caused by uneven exposure. 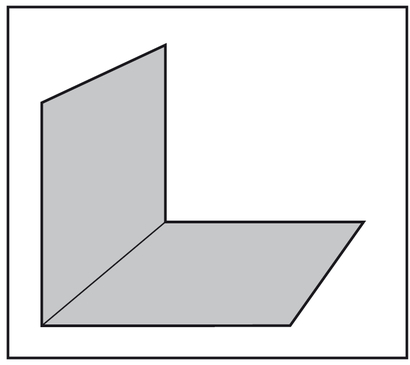 During exposure (curing), position the lamp as close as possible to the bonded surface. During curing, do not move the workpieces or subject them to vibration, use suitable fixing aids. Overexposure does not have a negative influence on the quality of the adhesive-bonded joint, but a positive effect is not achieved either. The loading capacity of the required connections depends on the design, the type of glass, the fittings that are used and the adhesive that is used. In case of doubt, a trial adhesion must be carried out. All UVA lamps offered by Häfele are equipped with special filters to prevent damage to the eyes and skin. For your own safety, wear suitable PPE equipment such as protective goggles with UV filter and disposable gloves and observe the manufacturer's specifications. The employer’s liability association recommends the use of suitable PPE equipment when dealing with UVA lamps. Curing via exposure takes place in two stages. The working strength is achieved during pre-curing (approx. 30 % of final strength). Pre-curing takes at least between 10 seconds and approx. 2 minutes, depending on the type of lamp. This allows easy removal of possible adhesive residue outside the bonding surface. After pre-curing, remove any fixing aids and remove possible adhesive residues from the workpieces with a special cleaner, glass scraper or grade 00 steel wool. Final curing takes at least 60 seconds to approx. 5 minutes depending on the type of lamp and the type of glass. After final curing (approx. 24 hours idle period) the adhesive-bonded joint reaches its full functionality and load bearing capacity. We cannot accept any liability for the adhesive that is used, the gluing method or any resulting claims. We appreciate your understanding for this. A trial adhesion always has to be carried out. That way, processes, materials and structures can be tested and adapted. A test piece has to be bonded according to the above-mentioned notes for this. 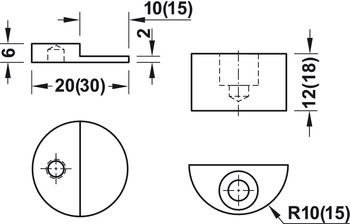 After bonding has taken place, stress the workpiece above nominal stress, e.g. through impacts, jamming, jerky movements, if necessary work with tools such as pliers. 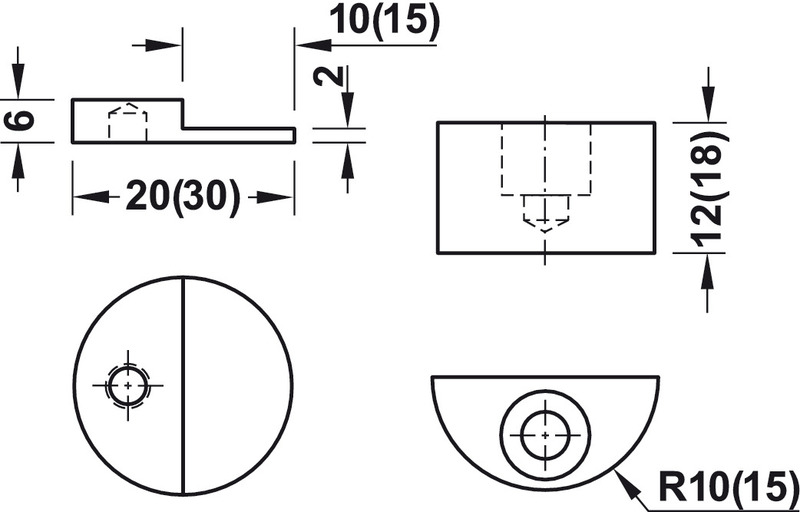 Stress the workpiece to until the material deforms or breaks, in order to determine the load limit. This section shows examples of how glass gluing accessories are used in practice. The handheld UV light is particularly suitable for bonding glass cabinets or glass furniture. The light weight allows you to work without tiring. 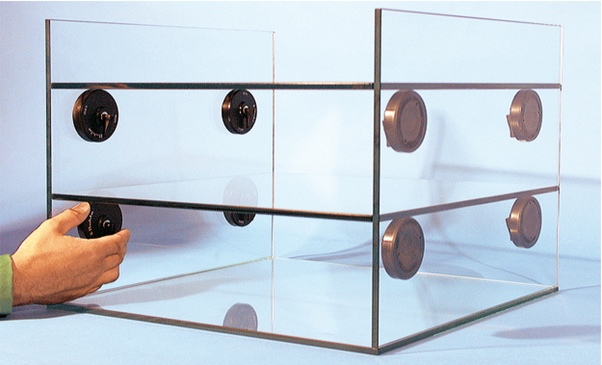 Construction of a glass cabinet used as basic element for many assembly constructions using four suction devices 90°. Especially the use of high-viscosity adhesives allows comfortable adhesive application by raising the attached panel by a pre-defined gap and then lowering again using an adjusting screw. 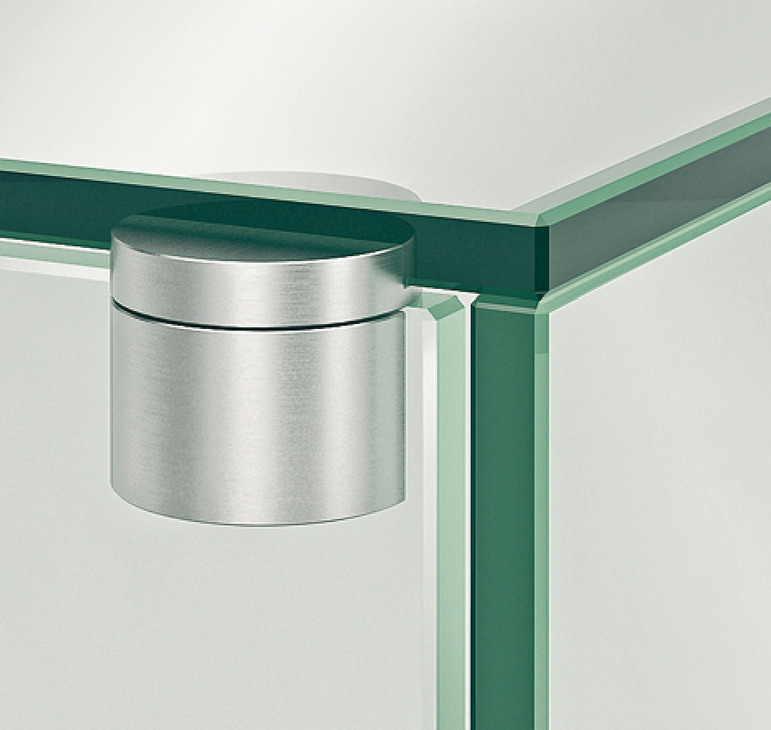 The raised glass edge serves as a guide for applying the UV adhesive. 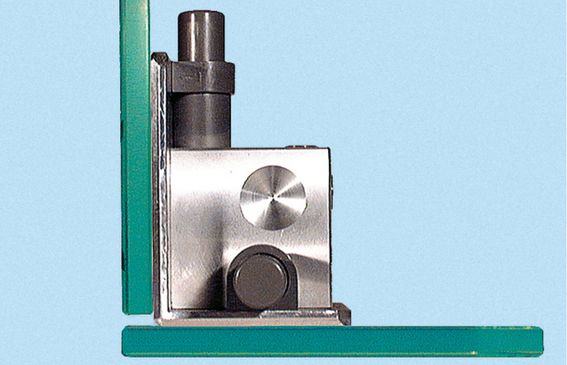 The glass pane cannot slip out of place and smearing of adhesive during lowering is ruled out. Neat and precise working is therefore guaranteed. Use of a continuously adjustable suction device at an angle of approx. 45° when bonding 19 mm float glass. The tension-free curing of UV adhesive is achieved in this case using a handheld UV light, Cat. No. 008.75.440. 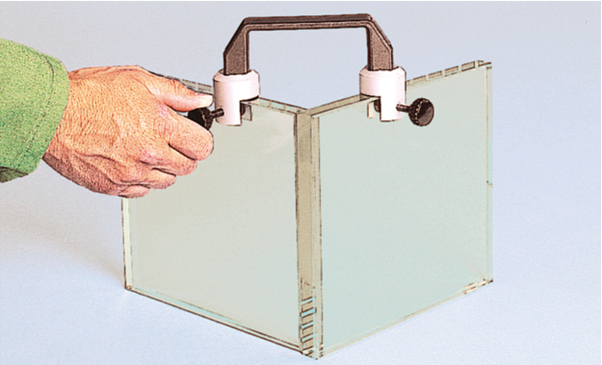 Glass cabinets or similar structures can be fixed in position in no time using 4 tensioning brackets. Particularly suitable when using thin-flowing (low-viscosity) adhesive. Prerequisite: Straight glass pane edge (no bevel), right-angled structure, short adhesion time. Tighten adjusting screws only slightly! 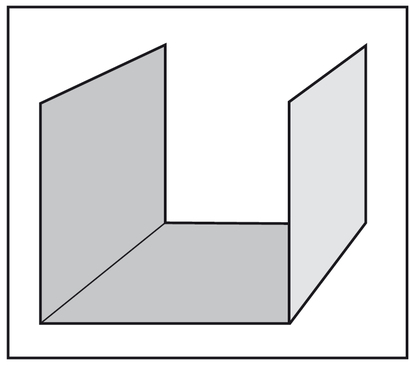 Two glass panes can be aligned in any required position using two guide pieces that rotate through 360°. 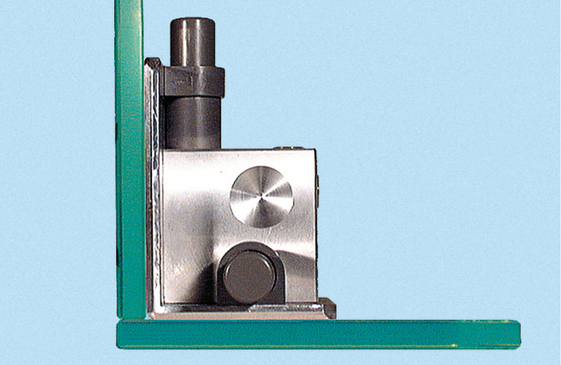 The plastic pressure screws cause no damage to the glass surface despite high holding power. Rotating the off centre disc provides up to 6 mm continuous fine adjustment of position. Glue fixing of an intermediate shelf is considerably easier using 4 off centre supports. 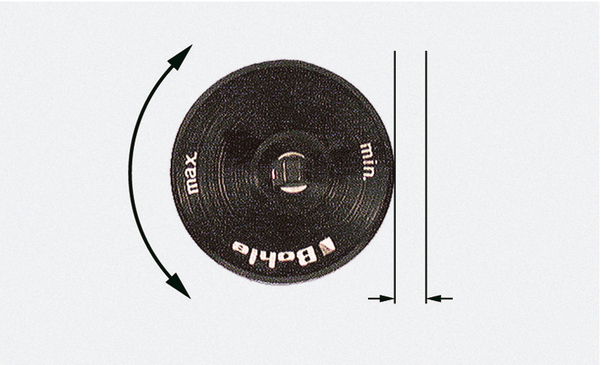 The right angle suction pump is placed in required position onto the glass pane and adheres to the pane by pressing the first pump tappet. Sufficient vacuum is reached after pressing the pump tappet 3 to 5 times. Repeat the process for bonding the second pane of glass. The red signal ring indicates loss of vacuum; the connection can be strengthened again by repeated pumping. The UV adhesives are applied to a pre-defined gap. 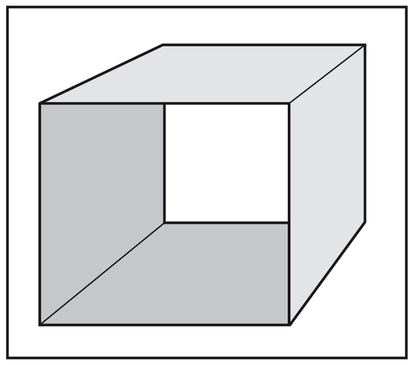 In this case it is sufficient to adjust and fix the required gap width. After applying thickly flowing adhesive, the ventilation valves must be activated and the bonding components must be lowered to their final position and re-fixed. A threaded pin in the hinge allows the door to be removed after bonding. Ratio height to width 3:2 must not be exceeded!